For other places with the same name, see Pruszcz (disambiguation). Pruszcz Gdański [ˈpruʂt͡ʂ ˈɡdaɲskʲi] (German: Praust) is a town in Gdańsk Pomerania, northwestern Poland with 26834 inhabitants (2010). Pruszcz Gdański is an industrial town neighbouring Gdańsk, part of the Tricity agglomeration. The Tricity Circle Highway begins in Pruszcz Gdański. The capital of Gdańsk County in Pomeranian Voivodeship since 1999, Pruszcz Gdański was a town in the Gdańsk Voivodeship from 1975 to 1998. During World War II, Pruszcz Gdański was the location of Nazi Germany's Praust concentration camp, a female subcamp of the Stutthof concentration camp. Polish State Railways has a railway station in the town. Mateusz Bąk (born 1983 in Pruszcz Gdański) a Polish footballer who currently plays for Lechia Gdańsk as a goalkeeper. ^ "Former Territory of Germany" (in German). 2017-11-28. 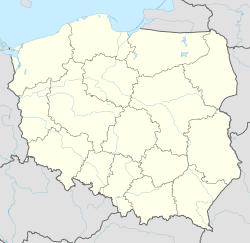 This Gdańsk County location article is a stub. You can help Wikipedia by expanding it.